My son Jack has been playing cello for 2 years and at the end of 2015 his teacher moved away. In early 2016 we found Melinda and she has taught my son Jack this year. Since Melinda has been teaching Jack, he is happy and enthusiastic to go to his lessons and his cello playing has improved remarkably. Jack also played at the end of year concert Melinda organised for all of her students. We would have no hesitations in recommending Melinda to teach students at your school. I think miss Mel is a great violin teacher and it shows how quickly I've improved.Miss Mel is a fun and caring teacher who I am very grateful to have I love getting taught violin with her. I have improved a lot in 1year. Miss Mel always puts her students before herself even if she really needs to do something. Miss Mel is the best violin teacher ever! It is with great pleasure that we are able to provide this reference for Melinda Coles. In the time Melinda has been providing musical tuition for Nathan, she has taken a boy who was losing interest in his instrument to wanting to practice whenever possible. Melinda has been providing tuition in the cello for our son Nathan for the past 18 months. Nathan had been studying the cello for 18 months prior and had become frustrated that he was not improving. Melinda has what I can only describe as the teacher’s presence. Nathan’s previous instructors were just that and while they could show him how to play the instrument, they did not develop the child. As a result, he found playing a chore and his interest was waning. She considers the child’s needs, providing encouragement and clear expectations where required. I feel the Nathan has progressed so far because he wants to practice to ensure every time he attends a lesson, he can impress Melinda with his development. Melinda clearly has a love of music and has high expectations for her students but she is also inspires and guides the students on their own musical journey as she takes as much interest in the children as the music.From the parent’s perspective, she is a great communicator, we always know exactly what Nathan is required to do and she makes us feel like Nathan is her only student. I cannot thank Melinda enough for her efforts with Nathan and when speaking with other parents at concerts these are sentiments shared by many. Testament to her great teaching is the distances people are willing to travel to attend her classes. I am writing this reference for Melinda Coles who has been my son, Jaidyn’s violin teacher for the past 5 years. Melinda is a wonderful teacher and is very dedicated and passionate about her job. She makes a wonderful connection with her students and is very in tune with where they are coming from. She strongly encourages her students to push themselves and to strive to achieve, but at the same time she is very sensitive to ensure those steps are within her student’s reach. Jaidyn has achieved amazing results working with Melinda and always looks forward to his weekly lesson. Melinda also established a monthly Celtic Fiddle Club and a weekly Bluegrass Fiddle Club both of which Jaidyn thoroughly enjoyed and rarely missed. We are very fortunate to have had Melinda in our life and she has played a very important role in building Jaidyn’s confidence and independence. Melinda’s goal has always been that her students enjoy themselves while they are achieving. Melinda would be a fantastic asset to any school and I could not recommend her more highly for what she would be able to contribute. My 7 year old daughter began with Melinda 2 years ago. Her attention span lasted 5 minutes, she would chatter constantly due to nerves and anxiety. She is now doing 20 minutes a week extra practice and gaining more confidence each week. She can last a whole 1⁄2 hour concentrating with Melinda and is totally absorbed in her lesson, she has even stated that her lesson went really quick today. Melinda makes each student feel special, she has a contagious love of music which she imparts on to her students, encouraging them to be the best that they can be and more. I am a mature age student, and have had private violin lessons with Melinda Coles for more than two years. I started my lessons studying Suzuki book 2 and have graduated book 4. Melinda is the best, very intuitive and knows how to work with the individual student, to reach full potential. 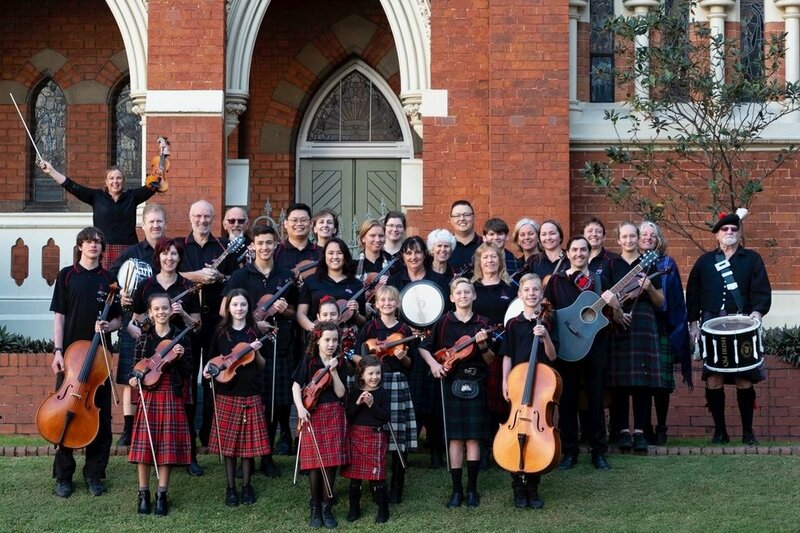 Not only that, Melinda has a beautiful personality , and a great smile, is very dedicated to her work with individual students and the Moreton Celtic fiddle club. It's hard to find enough words to praise her as a music teacher. Melinda Coles has been teaching my daughter cello for nearly two years and we have been extremely happy with her. She is a diligent, consistent teacher who builds a rapport with her students and encourages them to do their best. I would have no hesitation in recommending her. "I have been amazed at Amanda & Samantha’s progress with their music over the past 5 years. This is due to your dedicated approach to teaching and the way you encourage them. They look forward to their violin lessons each week, and love to play for family and friends. Amanda would like to be a violin teacher when she grows up." "Melinda has been teaching violin to our daughter Virginia since 2006. Virginia has no fingers on her left hand, yet Melinda was able to help her adapt to playing the violin using her right hand. Virginia has played in the school band and many other external performances with Melinda. Melinda's dedication, passion and dynamic personality has helped build Virginia’s self esteem and helped her recognised that very few things are impossible. We have recommended Melinda to friends in the past and would enthusiastically endorse her as a music teacher to anyone seeking a qualified, passionate teacher. “Melinda is patient, persistent, professional and positive! Anthea has progressed in leaps and bounds since you began teaching her”. After 2 years persevering with other teachers, my daughter Nadia was at the point of giving up playing violin. She had become very despondent and lost all motivation to continue. Fortunately, that’s when Melinda came along. Nadia’s attitude and motivation changed overnight. By sharing her own infectious love of music, Melinda brought back the ‘love of playing’ that Nadia had lost. Melinda built on improving Nadia’s skills, to give her ever-increasing confidence and enjoyment. Melinda also sought out every opportunity to involve Nadia in playing with others, including professional musicians, as a way of providing further motivation and enhancing her learning. Melinda was and still is the key to Nadia’s continuing playing. Please include your email address and contact ph: number.